I’ve already mentioned that I started a new job last week. What that means, from an eating out perspective, is that Friday night is no longer date night. I’ll be working Friday nights, but I’ll have Saturday nights, Sunday, and Monday off which is much better than my old schedule. Since we were out of town this weekend, our eating out in Kalamazoo day became Monday for lunch. When J got home from work, we needed to go grocery shopping, but both of our tummy’s were rumbling. J gave me the option to choose where I wanted to go which means I could have eaten any greasy thing I wanted, but instead, I decided to go somewhere I thought J would like. Last week, when we went to Lenny’s Sub Shop, J said she wanted to go somewhere that offered something lighter than greasy bar food. It wasn’t until we already ordered and were sitting down at Lenny’s that I remembered a new place that opened in downtown Kalamazoo. 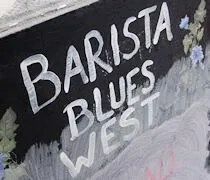 Barista Blues West takes up the corner space at Lovell and Burdick. The awnings still have the Good’wich logo, but there’s a sign board out front that advertises the day’s special and let’s you know there’s a new business in that location. If you’re wondering where the “West” part of the name comes from, J figured it out when she thought the name sounded familiar. 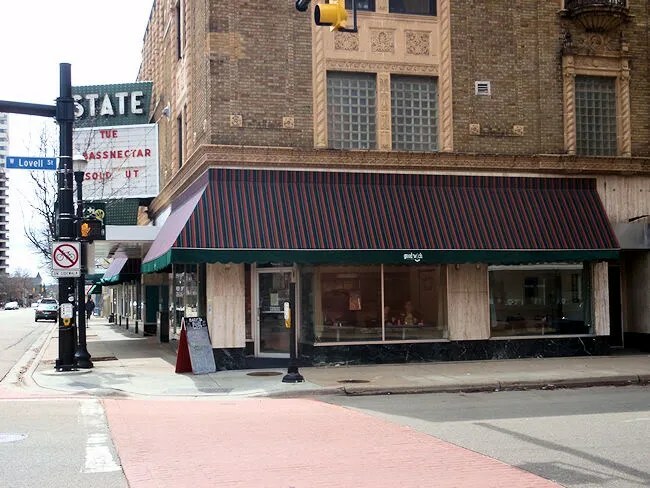 The original store is in downtown Battle Creek. We actually found a parking lot on the Kalamazoo Mall and walked about a block to Barista Blues. The space is pretty small. There’s an order counter and a lunch counter that overlooks the small kitchen area. There are a few tables in the rest of the space which makes up the small dining room. J started to head towards a table thinking it was a service type place, but I saw the employee get up and head over to the cash register so I headed that way and picked up a paper menu off the counter. My eyes went straight to the Pastrami Sandwich on the menu so that’s what I ordered. The sandwich is a panini served on rye bread with pastrami, Swiss cheese, and mustard. 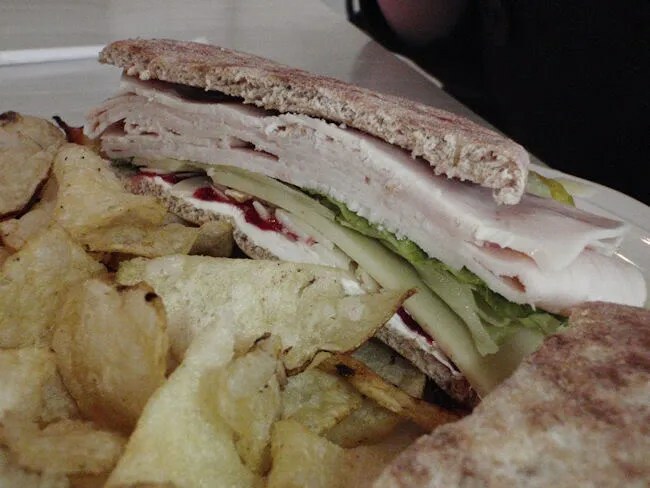 The full sandwich is served with chips and a pickle. 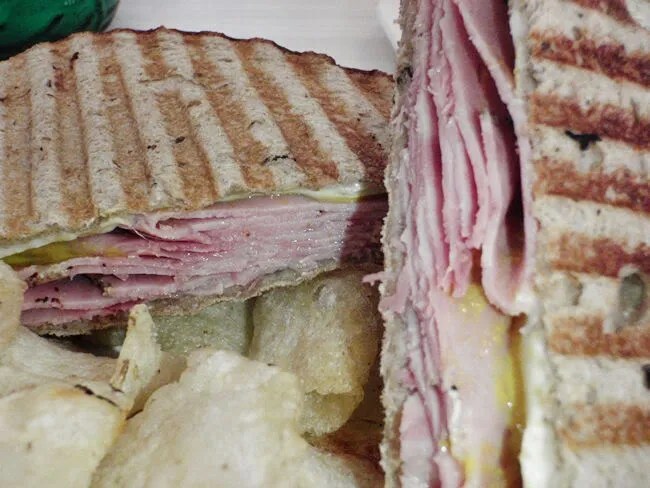 The sandwich was served in two triangles with great grill marks on the bread. There are only a few slices on pastrami between the two slices of rye, so don’t expect a New York style sandwich, but it is still a tasty sandwich with a very peppery pastrami and just enough mustard to make it tasty, but not too messy. The chips came out of a large white bag, so I have no idea what kind they were, but there was a large portion on the plate. J went for one of the specialty sandwiches. She got the Skinny Nutty CJ. The sandwich is served on a sandwich thin which we were both surprised to see. We use them at home and I really like the taste compared to a full slice of bread. Between the two pieces of the thin was cream cheese, cranberries, sliced almonds, turkey, Swiss cheese, and lettuce. She had nothing but good things to say about the sandwich. It actually looked like she got more food than I did, but it was probably a much healthier sandwich. She had so much sandwich, she shared about half of her chips and her pickle with me. The cost for the two sandwiches, a Coke, and an Italian soda was just a little over $15. The food was delicious. They don’t have a huge menu, but they do have some kind of specialty each day of the week. Today’s was a meatball panini that did sound good, but I never pass up Pastrami. J had told me about Barista Blues after eating at the Battle Creek location and I just sort of filed it away because I’m not usually in BC for lunch. We both enjoyed the Kalamazoo location and it’s another great option for a quick, cheap, yet tasty lunch in the downtown business district. It is not closing because business is poor, but because business at the original Battle Creek location is doing very well and more help is needed there.